Alpha Version 7 : Squad – Communicate. Coordinate. Conquer. For a summary of the major changes, please read our previous news post HERE. Note: There is a known camera bug when exiting vehicles including stationary .50 cals in the Firing Range Simply enter the Admin Cam (Shift + P) and exit the Admin Cam (Shift + P) to reset the First Person Camera. The bug does NOT happen in multiplayer. and take a vehicle without any responsibility for its usage. The system is entirely passive but also considered an advanced system. Only SL will interact and be notified as to the claim states. Only a Squad leader may claim a vehicle. The SL claims the vehicle by attempting to enter the vehicle or by approving a vehicle claim on his minimap made by members of his Squad. He will get one of several messages depending on the vehicles current claim condition. “Only Squad Leaders may enter unclaimed vehicles.” – You are not an SL.. Nice try! “Unable to enter due to another Squad’s claim on this vehicle.” This vehicle is already claimed. Please try a different vehicle or radio for a ride. “Vehicle Claimed.” – Great Job! Your Squad can now enter the vehicle and have a happy battle! 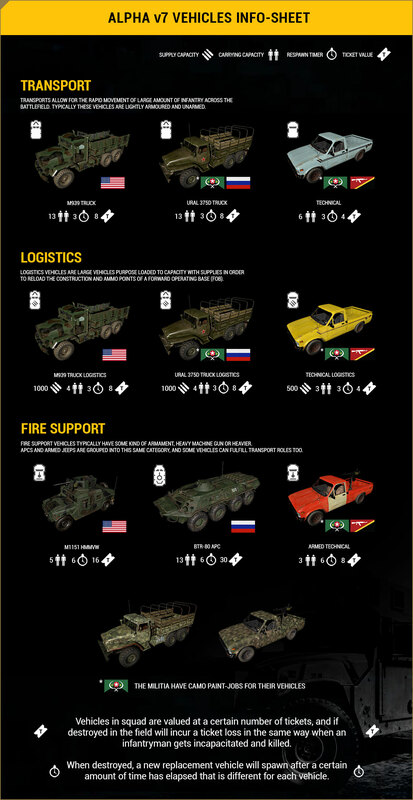 In addition, a squad leader can claim a vehicle by approving a claim made by his Squad members. If 3 squad members are near an unclaimed vehicle and the Squad has claimed slots available they can request a claim by attempting the enter the vehicle. Active Claims always give you complete control over the vehicle seats and the driver position. Players not in your squad cannot enter the driver seat of your actively claimed vehicle (but they can enter the other seats). In order to maintain an active claim you must have a squad member somewhere in the vehicle. for losing and/or choosing to lose a vehicle. We want to reward the good reasons and punish the bad ones. Here are some messages relating to dropping off your vehicle you will encounter. Additional Mechanics: There may be a good reason to want to unclaim a vehicle and we are providing a number of methods to do that. As with any experimental system: A lot will be changing as we get testing feedback and we will continue to refine and improve it. Forward Operating Bases gain an active spawn point after having been placed for 5 minutes (Unless visited by a friendly Logistics truck). Losing a Forward Operating Bases Radio now results in a 20 ticket penalty (was 10). You will need to press the “Unload Supplies” button (Default: “Q”) to unload supplies. Once a logistics vehicle has unloaded its supplies at a FOB the space in the graphical representation of the supplies goes away. You will need to restock the vehicle again to perform another resupply action. Drive to your main base supply depot to pick up new supplies. Added Scout kit for Insurgents and Militia. The kit contains SKS as the primary weapon and also has a set of binoculars. This kit is perfect for scouting and directing fire. Kit will get more toys in the future 😉 Kit unlocks at: 3 squad members and is limited to 1 per squad. Weapons with a foregrip have less vertical recoil than weapons without (M4 variants, PM md. 63 and AMD-65). Additionally it also has a faster sway pattern to simulate the pressure applied. Lastly they have an ever so slightly quicker ADS time than a weapon without. HMGs such as the M2 and Dshk are now able to sustain fire for a longer time without overheating, but cools off at a slower rate. to Insurgents and Militia. 50 points. The BTRs main 14.5mm cannon will be able to easily chew through all vehicles before it. The gun has Magnification that can be switched with the 1 and 2 Number keys. 7.62 Caliber weapons will be able to damage bring down soft skinned vehicles such as the technicals and trucks. Expect to spend up to several hundred rounds to reduce a healthy vehicle to a useless hunk of metal. Weapons in this category include everything from 7.62×39, such as the AKM, up to the 7.62x54R of the SVD. Pistol calibers have no effect on a vehicle’s health whatsoever. Conserve this ammo for self defense. Fragmentation grenades. Hand grenades, the RPG-7s fragmentation grenade and the GP-25s fragmentation grenades do little to no damage on vehicles. They are only able to slightly damage unarmored technicals and trucks. Use the proper explosives for the job! There are currently no indicators of your vehicle’s current health in the field. So keep track of what you have been fighting and return to base or a FOB to get fixed up and rearmed at a repair depot. Keeping your vehicle operational will give you a great advantage. Unlike most games, vehicle damage effects are not tied to a specific % of health. In Squad, effects such as a vehicle being on fire, doesnt necessarily mean that the vehicle is about to die. Vehicles such as the M1151 Enhanced Armament Carrier and the BTR-80 are immune to all infantry firearms and can only be penetrated by .50 cal or larger. The remaining vehicles can be penetrated by infantry rifle calibers. Addition of a Walking Animation while ADSing.Addition of a prone movement animation while moving around in Prone. Redesigned the FOB Status Widget and fixed a few cases where it wouldnt show up when it should. Added one of each vehicle type and variation to Jensens Range. All of them are enterable with no requirements. 30 second respawn timers on them. Before we sign off, there’s one last thing we want to share.